The weight of him manually propelling approx. 50kg with one arm is causing pain and inflammation to his elbow. We have had to therefore restrict self propelling to confined areas of school ad home where it is flat. This means at all other times he needs an adult with him at all times to push him. His size is making it increasingly tough on his carers and our physical well being as it is very hard to push him any long distances without hurting out backs. Probably one of the most important issues is that having a manual chair makes it very difficult to go on any surface that isn’t flat. Dominic therefore misses out on weeks at scouts and other clubs when they do outdoor activities that have rough terrain. It also makes it harder for Dominic to come for family walks with his dog (who is to be trained as an assistance dog) and take responsibility for having a pet. There are so many other places we could go if they were either more accessible for a manual chair or a powerchair could take the physical exertion and cope with more uneven terrain. 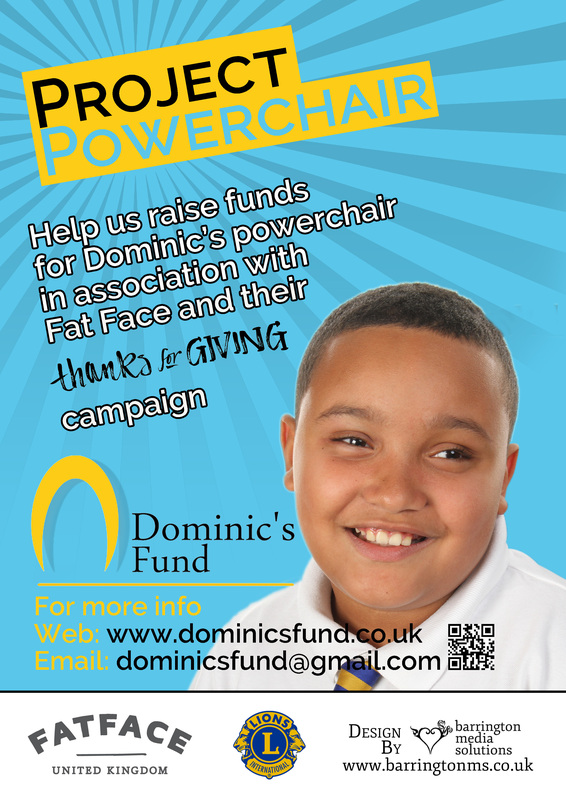 We have had a very positive demo of a chair that would suit Dominic’s needs but unfortunately like many special needs equipment comes with a very hefty price tag. To get the powerchair we need to find approx. £7000. The EG Lions club have very kindly donated £3500 towards this cost and we have also had some very kind and generous donations from family friends. We cannot express how much we appreciate your generosity. We have also been very fortunate to have been selected by FatFace EG to be their local recipient of their Thanks for Giving campaign 21st – 28th November. Various fundraising efforts will take place in store during this time and they will also donate a % of profits during those dates. The EG Lions have very kindly offered to accept their donation on our behalf due to needing a charity number. They will also accept donations form other businesses wishing to donate to Dominic’s fund but needing a charity number to do so.